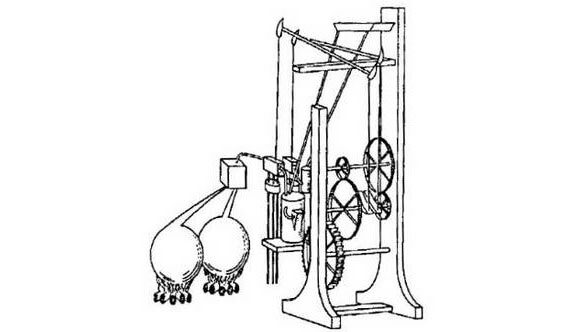 John Barber was an English inventor of the 18th century. He is most well known for inventing a gas turbine. Not much is known about his personal life, other than that he was born in 1734 in Nottinghamshire. However, according to some sources he may have been born much earlier than that in 1725 and been baptized at St. Nicholas Parish Church. However the case may be, it is certain that Barber lived in Nottinghamshire and then moved to Warwickshire in the 1760s. His profession was that of coal master and he used to manage collieries. Barber invented the gas turbine via a rotary motion engine which obtained gas by burning wood, coal, oil or other combustible substances. These were then directed into another vessel called a receiver and cooled. The mixture of air and gas was then pumped into cylinders and ignited. Water was added to this mixture of hot gas and the cooling effect would produce steam, which would be powerful enough to cause the turbine to move. The exact date of this invention is unknown but we do know that he held various patents between 1766 and 1792. In 1761, he entered into a joint lease with Fletcher and Tomkys to lease a colliery in Nuneaton. Barber later succeeded Fletcher as the owner and manager of the colliery. In 1766, he obtained his first patent, titled “Patent No. 865 – Obtaining Motive Power, applicable to Mining and other Operations.” This was to be a completely new method of raising water out of mines and ships, and for supplying water to cities and towns. It would also be useful for lifting heavy weights, particularly raising coal from coal mines. In 1767, he suffered a heavy financial loss of more than £5000 when he sank a shaft in the Stockingford area due to malfunction of the pumps. Barber’s next patent was Patent No. 1041 for a smelting furnace. This would help to purify the coal fossil, and extract and collect coal from its ore. It was granted on April 21, 1773. In 1774, he was voted to a local post in the elections held at Nuneaton. He opened his own colliery at Nuneaton in 1775. He obtained his next patent on March 12, 1776 titled Patent No. 1118. This machinery would help to drain mines and extract minerals from great depths. Despite all these inventions, Barber was financially unstable and officially filed for bankruptcy in 1784 and went back from being a colliery owner to manager. He is believed to have married a woman named Ann Williams of Manchester in 1785. His major invention, that is the gas turbine, came towards the end of his life. Patent No. 1833 was granted on November 30th, 1791 with respect to “Obtaining and Applying Motive Power”. The gas turbine was a method of using inflammable air to produce motion. This ensures John Barber’s name in history as one of the pioneers of automotive engines, although this fact wasn’t documented until much later. John Barber died in 1801 and was buried in St. Nicholas church. Although his inventions were mechanically sound, a lot of them failed due to lack of available technology to sustain them and the poor quality of metals and other building materials at the time.